I started using a second PC monitor many years ago. At that time my PC was a big cream-colored box, and the two monitors were bulky, heavy, expensive TV-type things. But the space, trouble and expensive were worth it. I still say today, adding a second is the biggest productivity-increaser you can do. Nowadays, most of us are working on a laptop, and that makes it far easier to add a second monitor! You just plug it in to the HDMI connector on your laptop, and Windows will find it. Go into your Display settings and you’ll find the place to tell Windows to “Extend my display onto this monitor.” You have to tell Windows where the monitor physically is (mine is to the right and somewhat higher than the laptop), so that dragging windows from one to the other feels natural for you. Once you have your monitor working, you might also think about mounting it on the wall in front of you. As I’ve gone into literally hundreds of home and office workspaces over the years, maybe 1 out of 20 has the monitor up at eye level where it belongs. Once that required unsightly plastic stackers (I piled up phone books, back when they existed) to raise the monitor, but modern flat-panel screens are very easy to mount on your wall. These things are amazing, easy to use, and really cheap. There are now LED specialty shops all over the place (including two in Progreso on C.78 near the beach), and they’re sold at the big places like Niplito and (for more money) at Home Depot. Easy to buy online too from places like Masluz. A typical package has 5 meters of LED’s rolled up on a reel. (Remember audio tapes and 8mm film? It’s a reel like that.) One end will have a connector on it, and you plug that into the power supply. Plug the supply into an outlet and the whole strip lights up. There are also LED strips made up of red green and blue (RGB) LEDs. These will come with a controller that connects in between the strip and the power supply, as well as a little remote control the size of a credit card. These strips let you change the colors, dim them, and even start them animating with constant color changes. And what can you do with these things? If you have a recessed area at the top of a wall, unroll a strip for beautiful indirect lighting. Stick a strip under a shelf for even lighting along the entire length. Light an entire china cabinet by running strips vertically down the sides. If you buy a strip rated for use outdoors, string it along anything to light the area. MOUNTING THE STRIP: The flexible LED strips come with an adhesive strip along its entire length; you take off the backing and press it in place. That’s great provided your surface is perfectly smooth, and perfectly clean. I find that strip does not work well, but there are lots of little clips (made for purposes like holding wire to a wall) that can be used to hold it up. CUTTING THE STRIP: LED strips cut easily with sharp scissors or wirecutters. BUT you must be careful to cut the trip at the right place! You will see the little square LEDs, and between them will be pairs of small copper foil surfaces. Cut the strip right across that copper foil, so you leave a bit on each of your cut ends. If you do this, you’ll be able later to solder thin wires to them and use the part you cut off for something else. This is just an easy idea that we’ve now done in two houses (in two countries). It is simply this: when designing your kitchen or bathroom, have an AC outlet (or two) installed under the counter, in a place where you will be able to reach it. Then have a 1-inch (2 or 3 cm) hole drilled above it in your countertop. I went back thru the site looking for things that worked and others that didn’t. For those of you thinking of doing something like this yourself, I offer all these helpful hints! Some may apply to you and help you out. This first lesson is WAY down in the process. but it is so important I’m putting it first. I had no idea how dangerous a bench grinder can be. The fact is, I am very lucky that I never took a big chunk out of one of my fingers while using this thing. At first I was not even using gloves, and it was a fortunately-very-small scrape of a knuckle that woke me up. One wrong move and you could be down to bare bone in a split second. I DID wear gloves from then on, and even wrapped the index fingers in ductape to give more protection. Eye protection–an absolute must. Even with the guards on the grinder, stuff BOUNCES. And I did this entire project wearing little rubber slip-on loafers. One day a tiny bit of white-hot tile dropped down in one of them. I think the burn is third degree since six weeks later it is still healing. Only the fact that it is so tiny kept this from being serious. It’s very hot here, and long pants would have killed me, but some additional protection would have been a REALLY good idea. Although this was a great experience, I really would advise doing something SMALL first! A 2-foot-square design on plywood would be a great start. I grabbed lots of images off the Web and pulled them into Photoshop. It was easy to do lots of interations and move things around. (In the original image she is swimming to the left!) Remember that the design had to be driven by the available material, not the other way around. I ordered the brown mosaic transfer paper from Mosaic Art Supply in the USA way back in May 2017. Although I used it a lot less than I thought I would, it was EXACTLY the right thing to get the critical head and body from the table to the wall. I really want to SHOUT OUT those folks; they stuck with me all the way thru this thing. My first real problem was with the sticky-back glass tiles, which over the months on the table really stuck themselves HARD and had to be pried off. That’s a warning: don’t let your project sit around for six months like I did. This was before putting those two transfer-paper areas up on the wall. It is a VERY good thing that I used a level to draw a line on the wall, and then gave my best “This should be horizontal” line on the surface of the paper. If I had not done that, I really would have been in a bind trying to get the sheets up at the right angle. Remember, I could NOT see the tiles–they were under the paper as I pressed it all to the wall. This stuff is priceless. In Mexico it is Resistol’s No Mas Clavos (“No More Nails”). I think in the USA this would be Liquid Nails, but look around. It has to grab IMMEDIATELY and not come off the wall. It should be thick, and helpful if it’s either white or clear. On that same page is the first time we see the hair on the wall. This really is a beautiful material; it was left over from our bathroom remodel. In Mexico it comes from Castel and you can see it on this page, but I know it’s imported and available in other countries (probably the USA) as well. The tailfin really did not come out the shape I had hoped for; I wanted a lot more definition between the two sides of it. The rule here is to STAND BACK MUCH MORE OFTEN and get the big picture. Doing a pencil drawing here would have really helped me, I think. This page shows the big paper printout on the table; it was finally uncovered enough to see. It was a HUGE help in laying out La Sirena at the beginning. I printed this out using Adobe InDesign; if you do not have software that lets you print something huge over multiple pages, then take your image to a shop that has a big chartplotter. This page is about not having enough tile. I know this happened because (1) we moved her over a bit, requiring more tile at the left end of her tail, and (2) I was putting up tile closer together than I did on the table (which made it look MUCH better). Moral: start with more than you need!! As part of that, I also had to change my whole process. I really could not spread adhesive on the wall, and then turn around and try to find tiles to fit. That’s great with a huge inventory of different sizes and shapes; but the fewer you have, the harder it gets, and the more cutting and grinding you khave to do. SO the process became finding/fitting/grinding tiles and taping them up (same page as above), then after doing 30 or so, mixing cement and gluing them all up at once. Ah, this was interesting, and very Mexican! The top edge of our wall was very uneven, and not level. That meant I had to use large tiles (easy to see in the photos so that sufficent tile would be cemented to the wall. Over the following days I would take whatever cement was left in the bucket after fastening the taped-up tiles, scoop it up in my hand and stuff it gently behind those sticking-up tiles. At this point, it’s a pretty smooth line up there; the tiles are cemented 100% up the back. This was fun. I forgot who suggested dropping in some fish, but it was a REALLY good idea. A quick trip to downtown Progreso found some ceramic fish being sold to cruise-ship visitors at ridiculous prices, and (two blocks away) these fine specimens priced very reasonably. 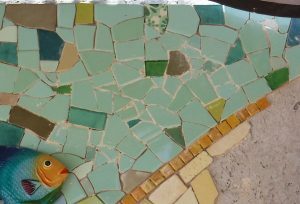 The fish look good, break up the sea, give La Sirena something to reach out to, AND meant I didn’t need so much tile! On that same page, a very good idea for laying out more of the “top row” tiles. Going up and down that little stepstool got exhausting; easily 100 times a day. But I realized that for the top row, I could just lay tiles on a single row on the table, and then cement and out them all up at once. No blue tape (which there was nothing to stick to up there anyway). Worked! There were HOURS spent scraping excess cement out from between the tiles. This picking tool was priceless. Radio Shack throws this in with their $11.00 soldering iron set; I don’t know another way to get one. I used both ends–the little flat angled one and the pointy one–both to very good effect. It lasted all the way until last week then finally snapped. I ground down a small screwdriver for the last few days. An existential crisis here. I asked myself “Is there so much color up there that Sirena is getting lost?” I was getting a lot of green tile that wasn’t the boring 1950’s bathroom stuff; this was brighter colors which I had to spread out. Trying to make things consciously look random is a real challenge! I think it came out OK in the end. I found what I hope is a very good sealer for the tiles. 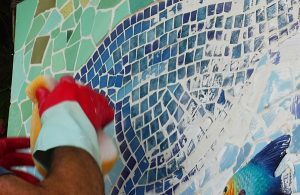 Barniz (varnish) from Bexel is made to work on all porous surfaces including ceramic. I brushed that on any tile that did not look like it still has its glaze; I had no trouble at all getting the excess grout off afterwards. I was very disappointed in the grouting float that I bought from Home Depot. Tiny bits of the black rubber came off in the grout; although you have to look hard to see them, I really expected better. Funny thing is, every Mexican construction guy I talked to said the same thing: to use a Sandala de Playa! That is, a flip-flop. 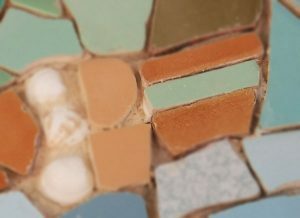 The rubber base of these is exactly the right thing, and you can probably find one that’s the same color as your grout. I’m serious. EVERY professional tile guy down here grouts with these things. The other thing on this page is the problem with the shells. I should not have glued these to the concrete wall, the ended up way deeper than the top of the tiles and would be completely buried by the grout. SOLVED easily enough: since shells are unlimited and costless here at the beach, I found some of the same size and just glued them over the tops of each one. The grouting bag was a problem too. It is way too big for this kind of detail work, and the whole is also too big. Solved by cutting it down, and shoving a grommet in the hole. 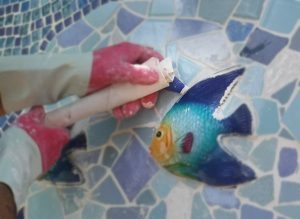 There is a much better solution on the Mosaic Art Supply site using an actual cake decorators nozzle. Going to their site for help after my first difficulties with the bag brought me one more no-brainer idea for this page: Go look for help FIRST! Which is what I hope you did coming to this page. And now that you’re all versed on what can go right and wrong, Go forth and TILE! On 30 April 2017, I downloaded some mermaid images off the Web. 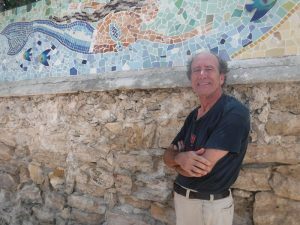 I’m calling that the official start date of the La Sirena project. 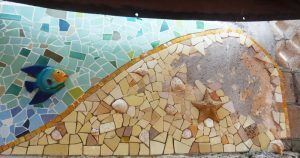 2:30 PM on 3 July 2018, 429 days later, the mosaic is officially completed. Here she is! There was an initial flurry of work in May and June of last year. I did the design, printed it out full-size and spread it out on three long tables. 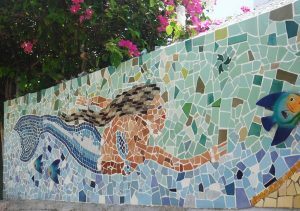 All of Sirena was laid out on top of the design, and I even put up a few tiles (the ones in the far lower left corner). Then we started traveling and did a lot of construction work on the house, so the next six months the project was on hiatus. It all restarted in January of this year, and this blog went online soon after. La Sirena is a bit larger than planned; about 30 inches high (it varies since there is no such thing as a straight line in Mexican construction) and 13’10” long. A fast calculation says there are more than 2,000 tiles up there (maybe I’ll count them one day). 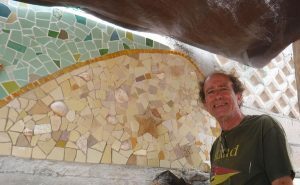 Today started with grouting all the seafloor. This was much harder than the ocean end of the project, because of all the shells. 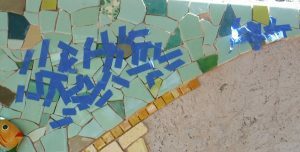 I could not use the grout float on much of the area without getting grout all over them, so I ended up using a ScotchBrite sponge for a lot of it. 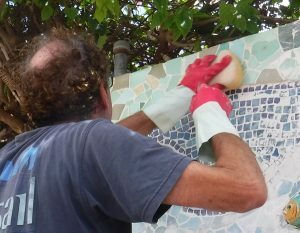 After grouting the seafloor, I got to work with the Grouting Bag filling in the crevices that I couldn’t get at with the float. The bag is a large version of a cake decorator’s frosting bag and works the same way. In this photo you can see the blue nozzle at the end of the rolled-up bag. 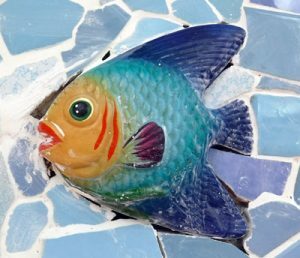 I’m squeezing the grout into the empty spaces around the fish. I’m glad I only mixed up a little grout for my first try at this. The bag was way too big and so was the nozzle. Over lunch I looked on the Web for some clues on how to improve the process. (Note to self: do this before you start something new!) 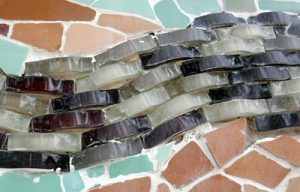 I learned that these bags really aren’t made with mosaics in mind; they’re for things like stone walls that still have big gaps but aren’t suitable for the grout float. I looked around for a way to make the hole smaller, and came up with a brass grommet. Glued it in with hot glue and crossed my fingers that it wouldn’t be pushed out by the grout. It worked! That and cutting the bag down to about 2/3 it’s original size (so it was much easier to handle) made the rest of the detail work go very well. 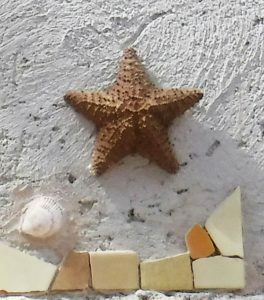 There was a LOT of it: the pottery fish, Sirena’s shell necklace, belt and bracelets; around her hair, and around all those shells and the starfish. So that’s it! By far the biggest art project I’ve ever done; one of the biggest projects of ANY kind, in fact. Which brings me to the next big question: What am I going to do tomorrow?? Next page: Nope, we’re done! It may not look like much change, but scraping out the excess cement is really hard work. I had been pushing to get all the tiles up and so left a lot more of this to do than usual. After the scraping and cleaning (I use the scrubby side of a ScotchBrite pad), I brushed the varnish onto the unglazed tiles. SO here is how the seafloor looks as of 2:00 PM today, all ready for grouting! Next (and last) page: 3 July–FINISHED!! At about 1:30 this afternoon, I put up the very last tile in this project. Sp took this photo to mark the occasion. Compare this to my last post on 28 June; I really pushed last week to get this done. Being so close to finishing does that to you! So, now what? 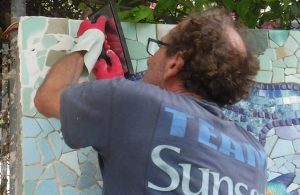 It’s the usual pattern: cleaning out the excess, sealing the old tiles that need it, and then grouting. 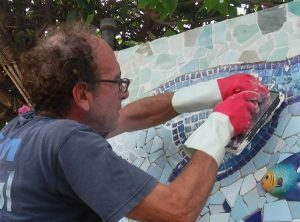 I also still have to use the grouting bag both in the sea floor area and on the rest of the mosaic. But this is going to get done this week! Lots of work over the last six days (in between rainstorms). First task was to decide how to END this thing! Up until this week I had the far end of the sea floor marked with a couple of vertical-straight-edge tiles (photo), but that just would not look good when we decide what to do with the ugly cinderblock wall to the right. The new right-hand end is a good 10 inches farther than it used to be. I’ve defined it with the same gold glass pool tiles used to separate the ocean floor from the water; from the top it curves down (covering a really ugly square concrete post) and then straight down to the base. You can see a tiny bit of the cinder block wall; it continues about another 10 feet to the right. There’s a lot of color mixing going on here, from yellow to brown to a beige that is almost white. Also a lot of large shells are joining the starfish! As you can see, there’s just a couple of square feet to cover. It has gone pretty fast, EXCEPT around the starfish; you can see a lot of small tiles in there that I had to use to make things fit. (Lots of chipping and grinding involved in all that.) The photo looks very mushy in the center; that’s the cement that I just did today; it has not yet been cleaned off. Amazing what a 3-hour hard push will do. I started around 10:00AM; by 1:00PM all the blue, green, and Sirena herself, was DONE. There is still detail work to do, which I’ll show you at the end of this post; but for now, it is a HUGE day in the life of this project! Here’s how I started. After mixing maybe 1/3 of the 5kg bag; I’m using the float to spread the grout over the tile, pressing it into the cracks. I can tell you right away, this is NOT the same as doing a tile wall or floor where all the tiles are square and the same thickness! I had to slide the float in all directions or it would miss whole joints where a thick tile would hold the float out away from a thin one. But the good (great, really) news is that instead of the grout bringing out all my irregularities in thickness and spacing between the tiles, it ended up masking nearly all of them! Even the glass tiles, many of which have no gap between them at all,ended up with a very nice white grout line around them. You really have to work fast, and nonstop. I took about a half hour to use up all the grout in the bucket. Then immediately starts the process of using the sponge to scrub off the excess. and the seashell bracelets and necklace have their own issues. They are buried way to deep for me to grout around them. I think the best thing to do, since I have an unlimited supply of shells, is to just glue a near-identical shell right to the top of each one. That should bring them up to the level of the tiles, and then I can grout around them. A LONG post today, because it’s a big day for La Sirena. TASK 1: Finish fitting and taping up tiles. This was a really long process as I’ve typed before, with many tiles taking 15-20 minutes to fit. But I got it done before lunch, and here’s the photo. TASK 2: Cement them in. I’m back to the Bexel “Solucion Total” cement, and I’ve decided I really don’t like it as much. But I got them up in good shape (assuming they STAY up). A few “Hazaa!s” at that moment. 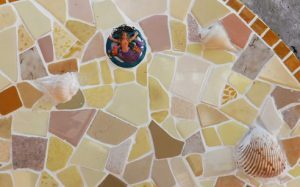 It has, after, been FIVE MONTHS TO THE DAY since I started this blog, and all the tile except the beach is ON THE WALL. and this green one (between her fingers). I next took some time to clean a lot of the tiles (not the ones just cemented) so I could begin to seal the worn ones with “barniz” (sort of a varnish). 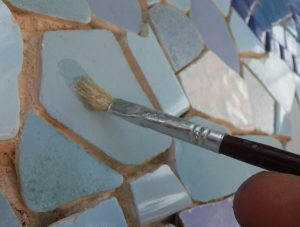 Only a small percentage of the tiles need this step; the ones whose glassy surface has worn off over time. This has to be done now, or the grout will be absorbed and badly stain the tiles. Although it looks like it might take forever, it actually is going very fast. So here she is! The next real change you’re going to see will be once I get grouting; the sand area to the right will come after that.